Sri Daya Mata and her party, consisting of Ananda Mata, Sister Revati, and myself, had been visiting Sri Yukteswar’s seaside hermitage in Puri. On about February 9th, we returned to the YSS Baranagar ashram, outside Calcutta, where we were living. 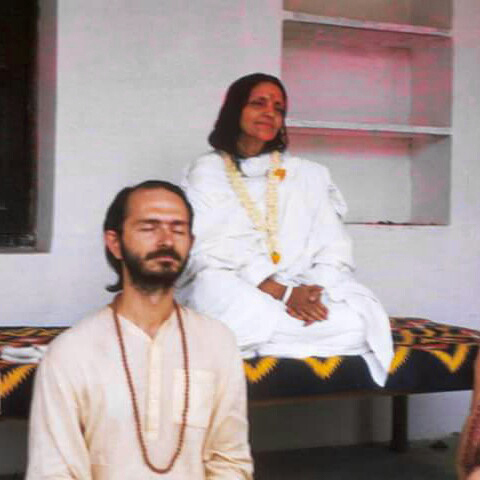 Soon after our arrival, we learned that, during our absence, Anandamayi Ma had come to Calcutta. What a thrill! Paramhansa Yogananda’s beautiful account of Her in Autobiography of a Yogi had inspired all of us, his disciples, with Her example of divine love, with Her ecstatic absorption in God’s inﬁnite Bliss. One of our greatest hopes in coming to India had been that we would have the opportunity of meeting Her. Now Divine Mother had brought Her figuratively to our door- step! We looked forward with keen anticipation to meeting Her. My own eagerness, however, was not unmixed with a certain anxiety. On Friday of that week I. was scheduled to fly to Madras to lecture at the SRF/YSS center there. Would I be able to see the Mother before then? It all depended on whether I could find someone to take me to Her, as I had no way of getting there on my own. “Do you know how to get there ?” I asked. My proposal was a bit sudden for the others in our party, but Mohini agreed to accompany me, and minutes later we were on our way. I meditated as we drove through the darkness. A peculiar joy ﬁlled me. Did the Blissful Mother already know we were coming ? Was She blessing me before I even met Her? I wanted a spiritual, not a social, contact with the Mother. Also, I felt timid at the thought of representing Master before such an exalted Being, unworthy disciple as I am. Better just to come in and sit unnoticed. I saw Her ﬁrst through a series of french doors which run the length of one wall of the assembly hall. At once, and every time I saw Her again during the days to come — even in semi-darkness, when I couldn’t distinguish Her features — I understood anew the meaning of Master’s words when he wrote of the blessing that ﬂows from the mere sight of a saint. There was no mistaking it. I was beholding a truly divine Being. I slipped quietly into the room and sat cross- legged on the floor at the back. There must have been about 150 people present. The Mother was speaking and laughing amiably. Her voice, as pure and bell-like as a little girls, thrilled my heart. I closed my eyes in meditation. Soon I began to lose myself in inner peace and devotion. After a time, the congregation stood up. The meeting had obviously come to an end. I couldn’t bring myself to move or to open my eyes, but the people around me began talking, so I assumed that the Mother had left the room. I hadn’t wanted to be introduced to Her, but now that She had retired I thought a little sadly, “It would have been nice to exchange just a glance with Her — even a loving smile!” But She was gone now. And who was I, anyway, to expect any favours? I contented myself with the inner blessing I knew I’d received. I continued meditating for several minutes. Then Mohini tapped me on the arm. But Mohini lovingly disregarded my reluctance. (He knew what I really wanted!) Approaching one of the Mother’s devotees, he made his request. Presently word came back that She would see me. I went and stood by the door of Her room, my heart beating with a mixture of dread and joy. Presently She came out. Sweetly she asked where I had come from, how long I had been in India, and a few questions of a general nature. I told Her that I am a disciple of Paramhansa Yogananda, adding that, thanks to Him, all of us in his ashrams in America felt great love for Her. This answer, and the way She uttered it, so thrilled me thatI could make no reply, but only smiled happily. “No. Why your body ? Your body is temporary. Ashram is everywhere. It cannot be limited. “In a spiritual sense,” She continued, “the meaning of the word, ashram, is, ‘ar shram noy’ — cessation from all compulsory activity. In this effortless divine state, all is perceived as one. The Mother, gazing at me quietly and affectionately, replied, “But I saw him come in, even though he was unannounced, I was watching him meditate. The Mother mentioned that the following day was the festival of Saraswati puja (worship). Saraswati is the Hindu goddess of learning and music. The Mother urged me, if I could, to attend the function. Everyone, including the Mother, laughed appreciativelv. Sri Ganguli remarked, “Aha! What did I say ? The cobra poison has begun to take effect!” Everyone laughed again. Mohini then relayed the wish of Daya Mata to meet the Mother privately. Because the Mother had not yet met Daya Ma, she somehow got the impression that it was I who wanted the appoint- ment. She rose to leave. With a full heart I thanked Her in Bengali for having come out again especially to see me. My heart was full. Eagerly I looked forward to the following day, when I planned to urge the rest of our group to come, too; and attend Saraswati puja at the ashram. 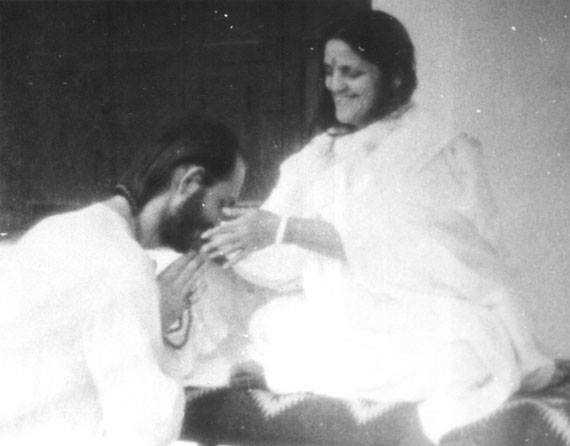 This entry was posted in anandamayi ma, anandamoyi ma, kriyananda, yogananda and tagged anandamayi ma, anandamoyi ma, kriyananda. Bookmark the permalink.